Malaga Airport (IATA code: AGP) is the only international passenger airport in Malaga province (Spain), located in the south of the Iberian Peninsula. It is situated in the Andalusia region, about 10 kms southwest of Malaga city, and is considered the oldest Spanish airport that has remained in its original location. Today Malaga Airport - also called Pablo Picasso Airport - ranks 4th among the Spanish airports regarding the air traffic and 22nd within the European Union. In 2007, it reckoned with a total of 13,590,537 passengers (10,001,021 on international flights) and 129,693 takeoff and landing operations. 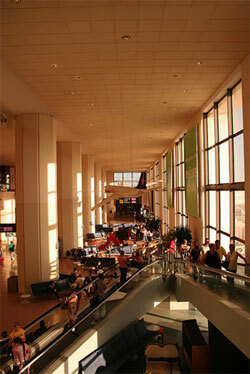 Malaga Airport was put into operation in 1919. From 1936 on, it has been an official air base where cabin crew members, observers and specialists of the air force have been educated. After the Second World War in 1946, the national and international air traffic for civilians was resumed and later in 1960, the airport's facilities were modernized, broadening the airstrip and the landing field as well as creating a new terminal in the geometrical centre of the airport which was inaugurated in January, 1968. A couple of years ago, the foundation stone for the new airport extension was laid. The amplification is supposed to be finished in the next year and as its result, a new parking lot, the extension and improvement of Terminal 1, a brandnew passenger terminal, a second landing field, an additional train stop as well as a subway line will be completed. By this means, the large amount of 35 millions of passengers per year will be anticipated, generating a benefit of 24,311 millions euros and a total of 335,500 direct and indirect jobs, including Malaga airport car hire services, private transfers, taxis and travel agencies. The new Terminal T3 at Malaga airport is available since the inauguration in 2010, the 16th of March; it will be the main airport terminal and is located next to the T2. All flights from and to EU destinations are now leaving from this new building, which impresses with a high, transparent construction. In the edifice are at the service of the customer the latest technology combined with a wide range of shops, international brands, cafes and exclusive restaurants, in order to make the wait as pleasant as possible. By the end of 2010 will be as well operational the new airport train station, two exclusive access roads to the airport and a second runway. We have included some useful resources in our website such as arrivals and departures information, also parking details and a map of the airport. Further information can be found at Malaga airport official website - www.aena.es, or calling this phone number: 0034 902 404 704. You can also contact them by email: infoagp@aena.es.